Three reporters from MoCoYoJo covered the Model UN conference May 7 in Monterey. Lexi Rohr (PG High) along with Joyce Doherty and Melissa Pavloff (both Carmel High) conducted a news conference, then wrote a wrap-up story for The Herald. From left: Pavloff, Rhor, Doherty. 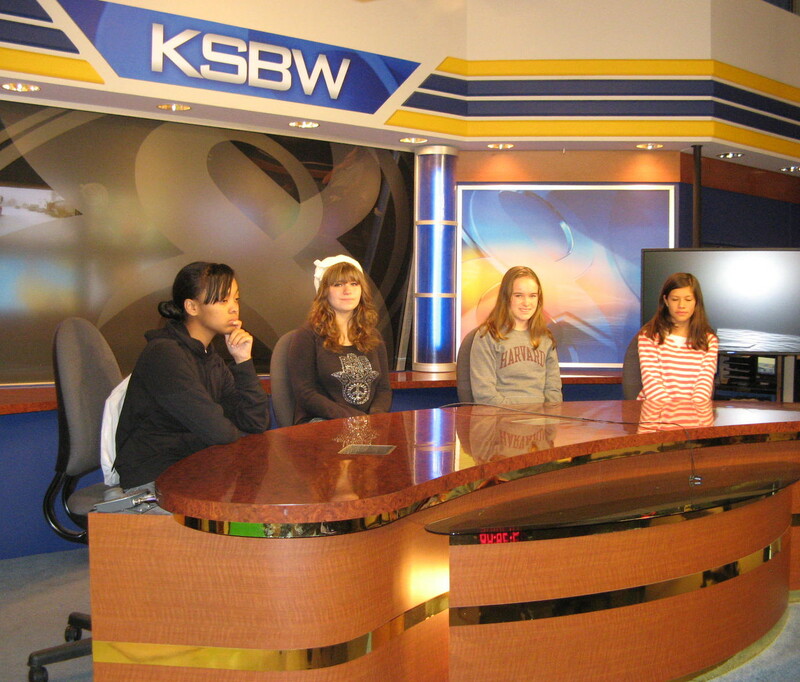 This year's MoCoYoJo class visited KSBW-TV in Salinas Dec. 19 for a tour of the newsroom and studio. Hosted by News Director Lawton Dodd, the students watched a live newscast and then had a chance to ask questions of the crew. 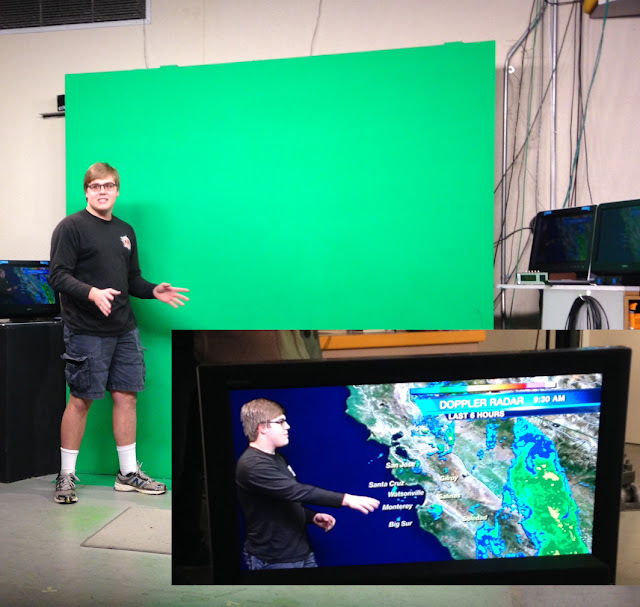 Pictured below: Zac Buzza of Carmel High stands at the green screen used for the weather report. Inset shows how the weather map is inserted electronically as Zac gives his forecast. Zac Buzza: Students and teachers question value of "Common Core" approach. Grace Davis: Carmel High struggles to keep the peace with residents living near campus. Ethan Nemiroff: Do students get enough sleep? Would a shift in class schedule help? Alexandra Roden: A dearth of young volunteers is hurting non-profits like Meals on Wheels. Drew Sharek: Concern mounts about head injuries in youth soccer leagues. The MoCoYoJo schedule for 2015 has been posted. Register now for classes, which are open to all high school students in Monterey County. Classes this season are on Monday afternoons: Nov. 9, 16, 23, 30 and Dec. 7. All sessions will run from 4 p.m. to 5:30 and will be held in Pacific Grove. This is a great opportunity to learn about news media and, perhaps, get started on a career path in journalism. It's a perfect fit for any students who work on their school newspaper or yearbook, as well as for students considering taking part in the Mock Trial journalism competition in 2016. The fee is $25 for those able to pay; free for anyone unable to pay. Call Lyceum for details: 831-372-6098. 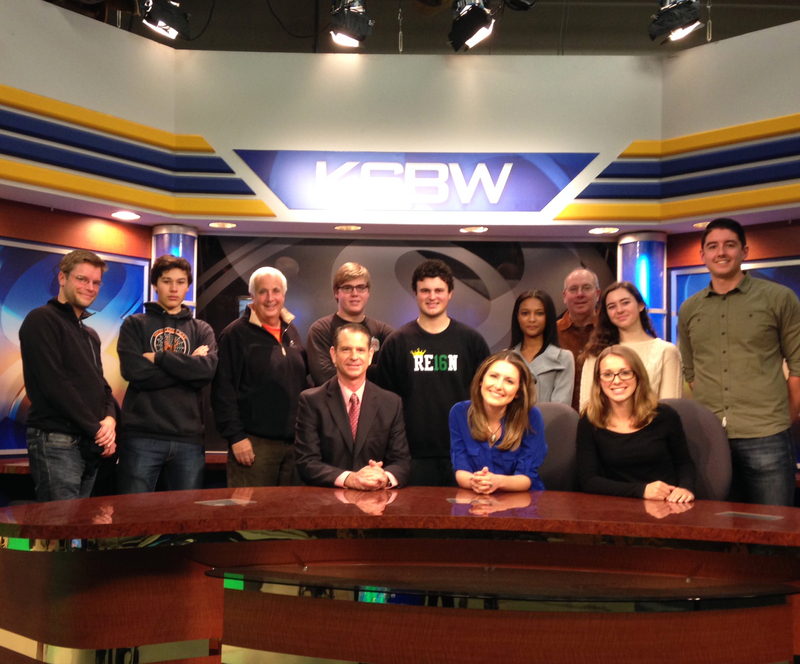 The third session in this year's MoCoYoJo program featured a tour of KSBW television's headquarters in Salinas. Students were hosted by the station's news director Lawton Dodd, along with weekend anchor Jacqueline Mazur (who attended PG High) and meteorologist Carl Thormeyer. Students weigh anchor at KSBW's studio. Rachel Davison and Dina Zawadzki. ﻿ The students got a close-up look at the studios, control room, newsroom and other facilities, including one of the station's three mobile transmission units. Dodd's advice to aspiring reporters was to get a good, well-rounded education, and learn the basics of journalism, before focusing too intently on the mechanics of media. The second session, Nov. 19, focused on basic skills of journalism. Students also discussed assignments for upcoming stories they will write for The Herald. The opening session, Nov. 12, was held at The Herald's headquarters at Ryan Ranch, where students learned the steps in producing the paper -- from the newsroom, to the pressroom and out to the delivery trucks. The program is open to all Monterey County high school students, and those interested are still encouraged to sign up. MoCoYoJo is conducted by Peter Funt, and sponsored by Lyceum along with local media. 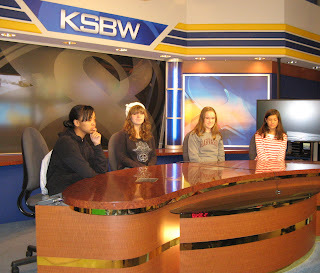 Sessions include tours of The Herald newspaper, KSBW television, KAZU radio, and the Monterey County Weekly newspaper. Again this year, students will be given the opportunity to write news stories, the best of which will be published in The Herald and broadcast on local radio. 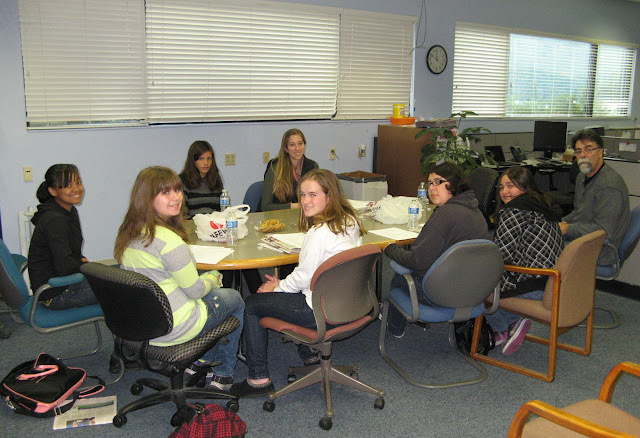 MoCoYoJo students during a snack break in the newsroom Nov. 12. Students already enrolled in this year's program come from Marina High, PG High, Santa Catalina, RLS, Monterey High, Salinas High, North Salinas High and Ocean Grove charter school. For more information, contact Lyceum's Joyce Breckenridge (831-372-6098) or Peter Funt (email: Peter@CandidCamera.com). Below is some of the best work from the program's first year. With the school day starting so early, intense homework loads, and sports or after-school jobs, the lives of high school students are so busy that many are awake longer than they should be. The National Sleep Foundation indicates that lack of sleep among teenagers can result in difficulty focusing, taking in and retaining information, irritability, acne, plus a tendency to overeat. In order to steer clear of those nasty side effects, teens require between 8.5 and 9.5 hours of sleep per night – depending on the individual. Biologically, teenagers need more sleep than adults until they reach their early 20s. After closely observing students’ use of technology during the past year, officials at North Salinas High School are considering new and tougher policies regarding iPods, cell phones, and other personal tech devices. During each school year teachers confiscate a myriad of electronic appliances due to their abuse on school grounds.